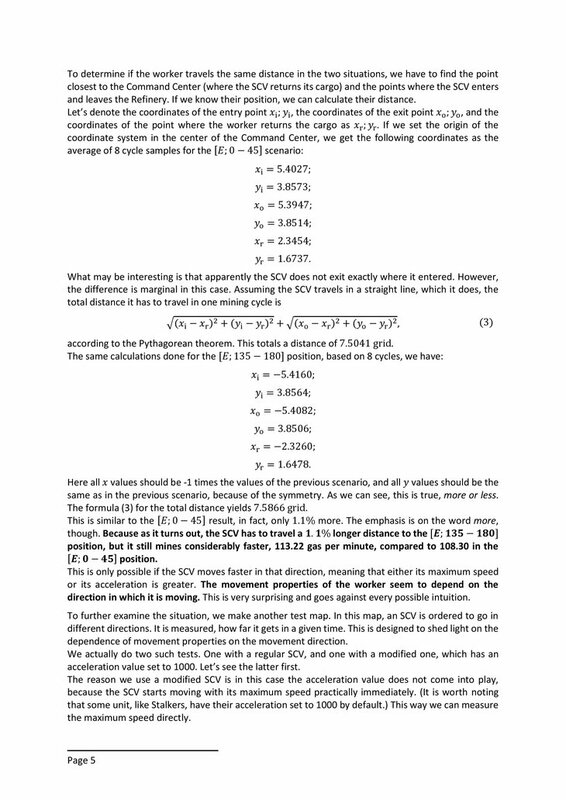 I am back with another analysis; this time about the discrepancy of gas mining rates from different geyser positions. The phenomenon itself was described years ago in detail in Orek's excellent post. However, as far as I know, there has not been an explanation for that. My goal was to find one. 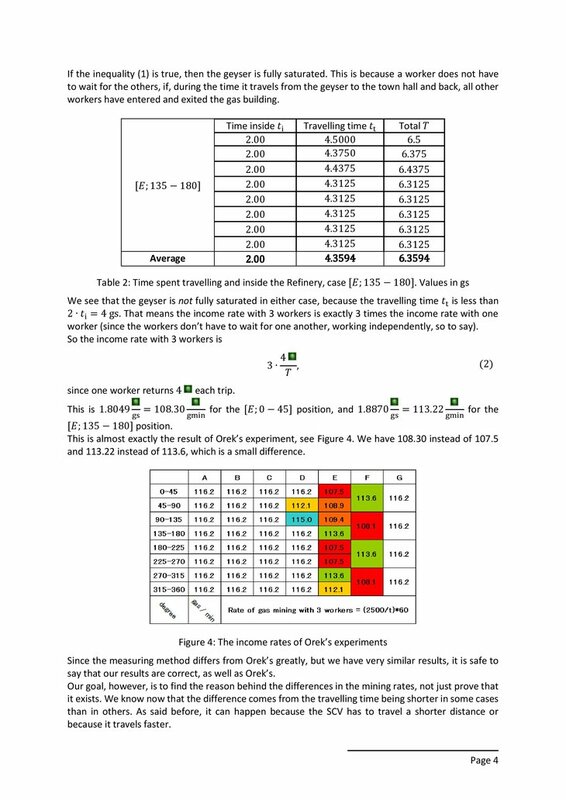 Basically the phenomenon is that some vespene geyser positions generate more income than others, even if symmetry would suggest that it is impossible. I recommend that if you should not be familiar with it, do read Orek's post, because it really covers everything you need to know about it. The workers spend less time inside the gas in some cases. They spend less time travelling because they have to travel a shorter distance in some cases. They spend less time travelling because they travel faster in some cases. All three possibilities seem to be impossible; the first and third for obvious reasons, the second because of symmetry. One of them still has to be the case, though. To find out which one, I used the Editor once again, as in my previous experiment. 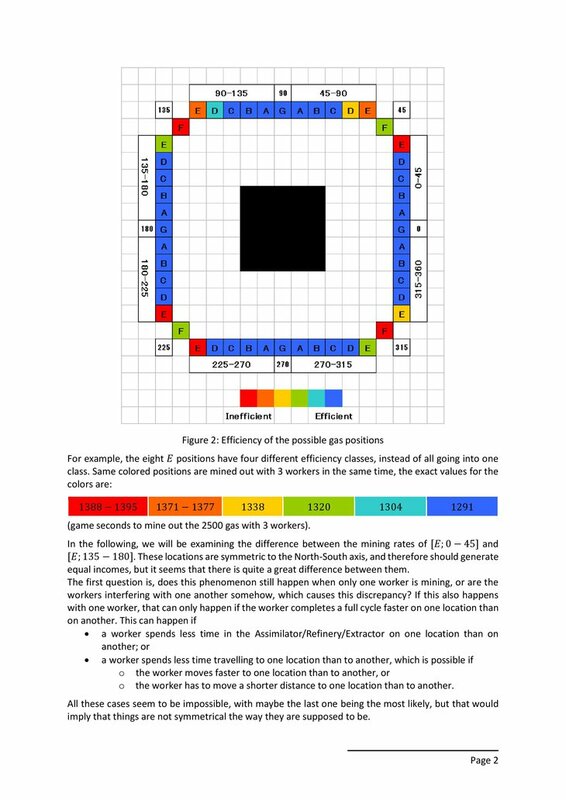 Having compared two gas locations that should generate the same income but don't in fact, it turns out that workers always spend exactly 2 gs inside the gas building, and they travel the same distance approximately. In fact sometimes they travel a longer distance in shorter time to one geyser than to the other one. This only leaves one possibility for the reason of this phenomenon, namely that units' movement properties depend on the angle they are facing. That's right, a worker, and any other unit as well, moves faster in certain directions than in others, regarding both maximum speed and acceleration.This is very bad. Experiments show that units generally move and accelerate fastest around 225° and slowest around 45°. This seems to be the reason for the mining discrepancy between different gas positions. I have no idea why this happens, though. I, personally, was very surprised to find this, so I wonder what you think about it. Also, any suggestions, criticism and ideas are appreciated . So we can safely infer on cross spawns one player will always get scouted first even both players send unit at exact same time from exact same distance from the other player. 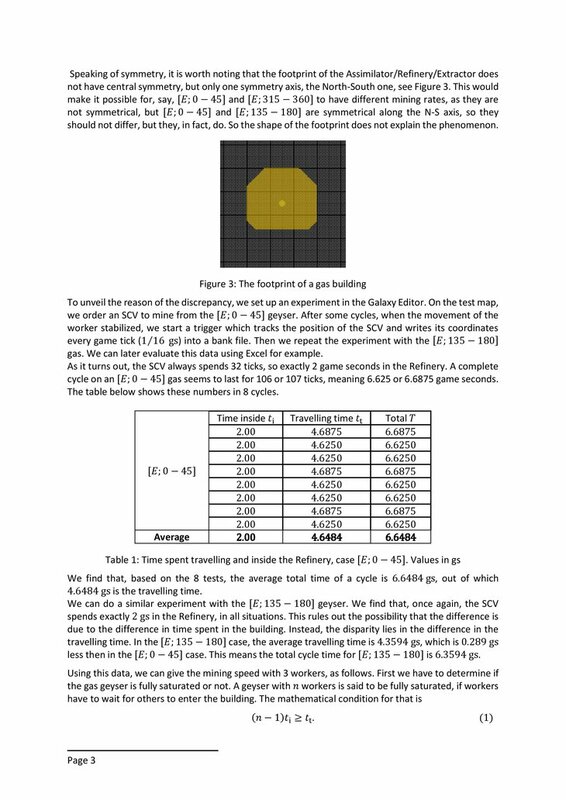 Hats off to you who makes these calculations and a lot of work. The jackpot question is I guess, then, should we rotate the map to the direction such that our scv can move more quickly to the gas geysers. 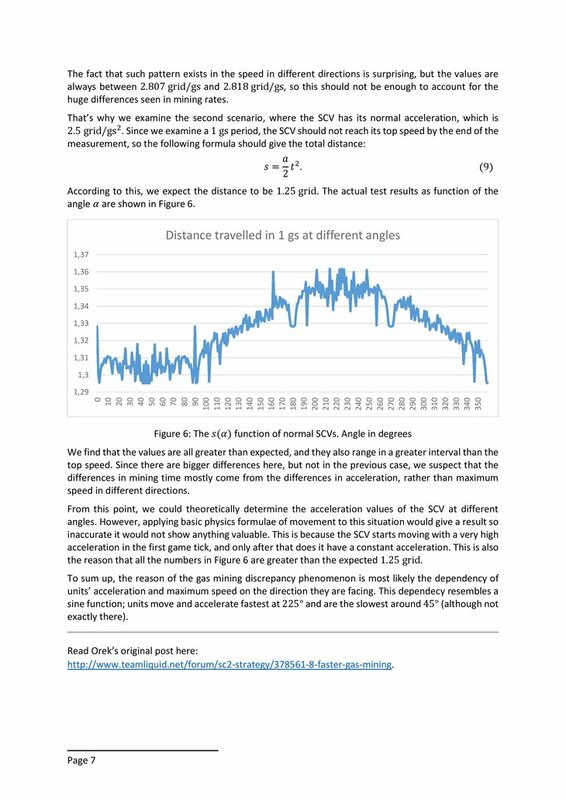 Also if the acceleration and the max velocity are all sinusoidal functions, should that not mean there is a optimum direction (namely, at 225 degrees as defined in your article) that the mineral patch should face relative to the CC? I was always under the impression that overlords travelling southwest were faster. I thought it was only my imagination, but there seems to be truth to it. So my question is: do all units have the same absolute speed-increase when travelling south-west or is it relative to their actual moving speed? This thing has actually always bothered me tbh. I remember on some of the WoL maps not only were the gas distances further but then you also had the angle. It's easy to understand in retrospect how this is even worse than we even originally thought, but man, I really wish they'd do something about this. Anyways thanks for shedding some light on this mistery! This is very well done. I am surprised that this is the case, that things accelerate faster in different directions. It seems obvious that this would be true of the other units as well. Did you test this with any other unit? will read again tomorrow, probably a few times! WOW holy ****, hats off to you sir, AMAZING work. 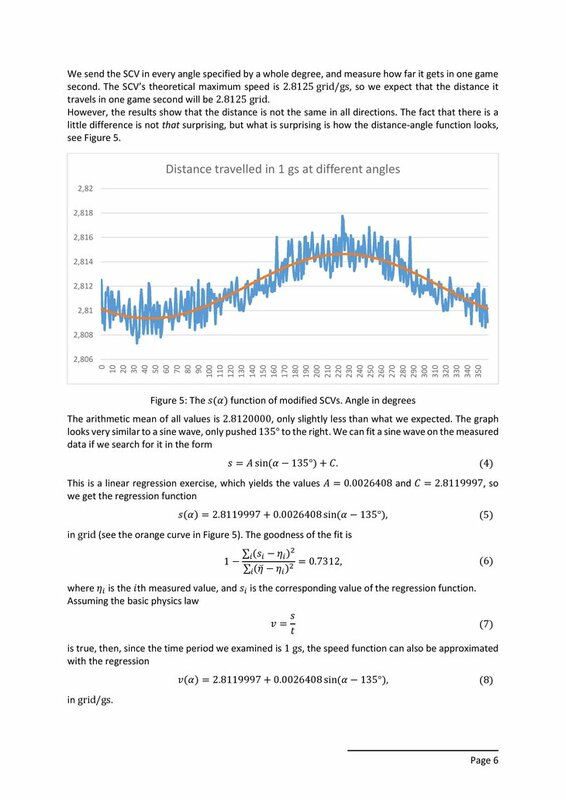 Oh wow the very small differences in unit speeds based on the angle you are moving at is incredibly obvious when actively showing a units move speed. Nice find!!! edit: I think this is probably going to be most significant for situations where moving just a littttttle bit faster than another unit matters. Think chase scenarios, especially where you only need 1-2 more hits to kill. And obviously where the verrryyyy small difference in speed adds up over a long period of time (mining). [*]They spend more time travelling because they have to travel a shorter distance. [*]They spend more time travelling because they travel faster in some cases. How would it take more time to travel shorter distance when moving faster??? It feels like an hypothesis made AFTER the research was concluded. But yeah the fact unit pathing and movement is radian dependant isn't new in a video game. It's a propriety of nearly all pathing that it will favor one side over the other, maybe in this case the engine only refreshes one direction before the other in a cyclic way. Or it may simply be rounding "error" with either the sin/cos functions or the vector additions. 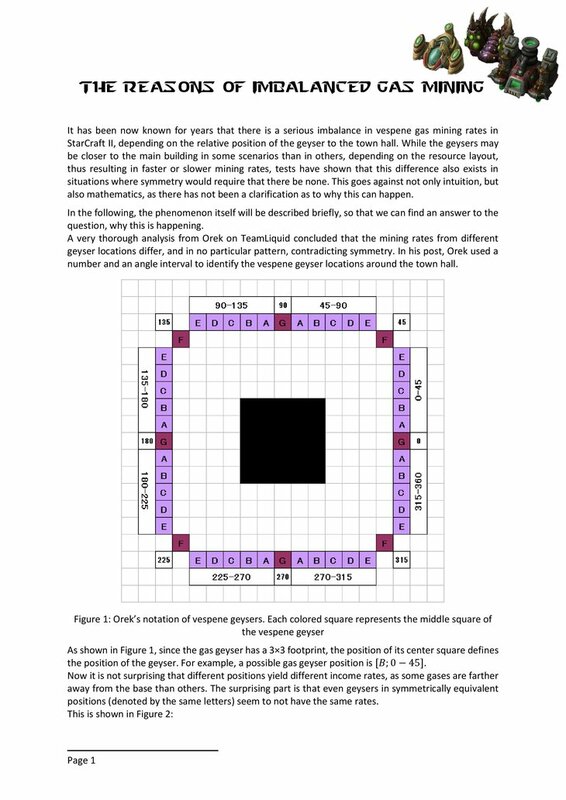 But out of curiousity, wouldn't it mean minimg imbalance of mineral too in diferent patches disposition/orientation? Can you also test few military units (spine crawler, marine, slow/speedling, mamacore, medevac) to see if the acceleration difference is consistant there too? Anyway thank man for the !!science!!. *If I may suggest for table 2 to use the same ammount of precision on all values of Total T (add the missing 0s). I am sad because this is a competitive game. Great work, thank you putting so much time into improving SC ! Proof that Scrap Station was the most balanced map ever! Hmm the differences seem very minor. Can't see this having much effect except for mining. Interesting. I always assumed the reason was the footprints being slightly off-centre, but apparently I was wrong. E 0-45 and E 135-180 should be the same distance - but the fact about different travel speeds is true, yes.